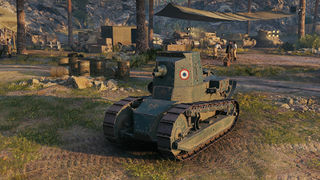 The Renault FT 75 BS is a French tier 2 self-propelled gun. An SPG with the 75-mm short-barrel S-type Blockhaus Schneider howitzer installed in the armored cabin. 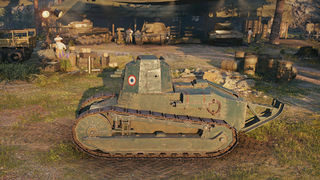 It was larger than previous guns, which increased the vehicle mass to 7.3 tons and cut its ammunition to 30 shells. High command saw value in the project and placed an order for 970 vehicles. 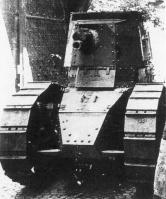 By the end of World War I, a total of 39 vehicles were manufactured; after that, production was discontinued. There is no reliable information about participation of this SPG during the 1940s, but some vehicles took part in battles in North Africa. Two SPGs were captured by the Allies (U.S.A., U.K., France) during Operation Torch. 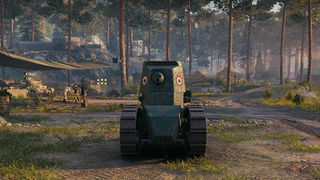 The Renault FT 75 BS leads to the Lorraine 39L AM. This page was last modified on 23 October 2016, at 20:43.